On November 7, 2018, the Waterloo Global Science Initiative (WGSI) released a report: The Generation SDG Blueprint. 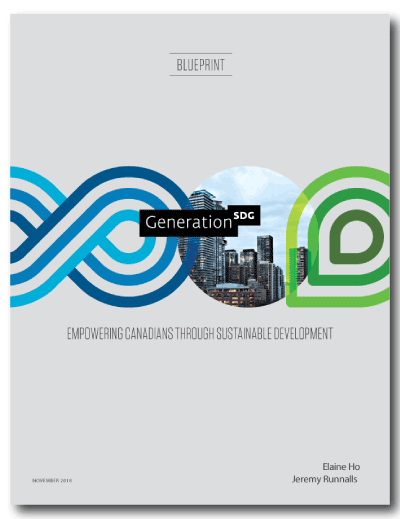 The report provides “a vision for a community-driven approach to the SDGs,” focusing on four key areas: community ecosystems and planning, partnerships, accountability and financing and stimulating innovation for the SDGs. Maintain a reputation as a neutral entity providing data for informed decision-making. Another Winnipeg initiative highlighted in the report includes: Meet Me at the Bell Tower, a weekly gathering, facilitated by Aboriginal Youth Opportunities (AYO), aimed at providing a safe place for people to meet, form relationships and build a stronger community.